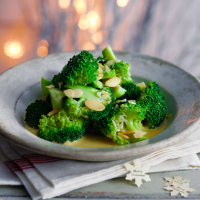 Breathe new life into broccoli. Warming blanched florets in a mixture of stock and brown butter, then garnishing with toasted almonds, gives the vegetable a rich, nutty and fresh character. 1. Put the butter in a pan over a medium heat, whisking continuously, until the solids turn golden brown and give off a nutty aroma. Strain the butter through a coffee filter, discard the solids, and return to the pan with the stock; heat gently until melted. Using a hand blender, blitz the liquid until fully emulsified. Season and set aside. 2. Fill a large pan three- quarters full with water and bring to the boil. Carefully drop in the broccoli. Blanch for 2-3 minutes (depending on the size of the florets). Drain, then place in a bowl of iced water to cool completely. Set aside. 3. Preheat the oven to 190 ̊C, gas mark 5. Put the almonds on a tray and toast for about 5 minutes until golden brown; set aside to cool. 4. To finish the dish, warm up the butter and chicken stock emulsion, add the broccoli and heat until warmed through. To serve, place in a deep bowl and garnish with the almonds. This recipe was first published in Mon Nov 30 13:27:00 GMT 2015.